"This is a variation of the chow mein clusters that you often see around Christmas time! It's easy to do with the cereal you have in your cupboard; in fact, that's how I invented the recipe! 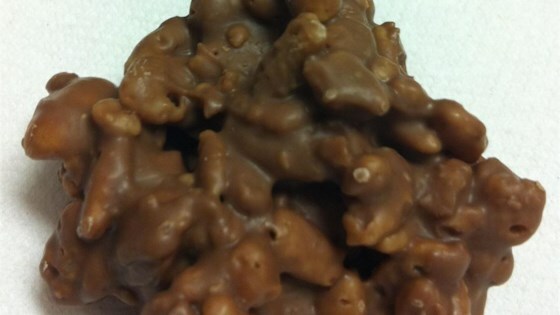 The Rice Krispies® make it reminiscent of a Nestle® Crunch bar." Set up a double-boiler over low heat. Put baking sheets into freezer to cool them. Combine 1 1/2 cup chocolate chips and 1 1/2 cup butterscotch chips in the double-boiler and mix continuously until nearly melted, about 10 minutes. Add 1/2 cup chocolate chips and 1/2 cup butterscotch chips; continue to cook and stir until the chips are completely melted, about 10 minutes more. Fold rice cereal and salted peanuts into the melted chip mixture. Remove baking sheets from freezer and cover each with a sheet of waxed paper. Remove chocolate mixture from heat and drop spoonfuls of it onto the waxed paper. Heap the cookies into tidy piles for visual appeal. Put filled baking sheets into the fridge until the chocolate hardens, 15 to 20 minutes. these are REALLY good! all of my family loved them! i would highly suggest these! have fun!